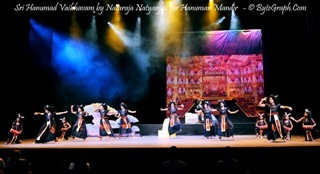 “Fabulous,” “We could feel the Lord’s divine presence,” “We want this wonderful drama staged again” – these were some of the immediate feedback received by an awestruck and teary-eyed audience who attended the ‘Sri Hanumad Vaibhavam’ grand dance drama event organized at Ferst Center for the Arts (Georgia Tech) on September 29th, 2013 by The Hanuman Mandir in Alpharetta, GA and Nataraja Natyanjali dance academy to support the cause for Mandir’s land procurement. A group of 50 performers—almost all of them children of varying age groups—from Nataraja Natyanjali Dance Academy treated an almost full capacity audience (around 800 people attending from Georgia and neighboring states) with a wonderfully conceived, planned, and executed Kuchipudi dance drama based on Lord Hanuman. Under the tutelage of Guru Neelima Gaddamanugu and a great hard work and commitment from the children’s part, this epic dance drama came to life. Seshavataram Puranam – Founder of Hanuman Mandir, Rakesh Garg – President of the temple, Neelima Gaddamanugu – Nataraja Natyanjali Academy Dance Director and board member of Hanuman Mandir, Subash Razdhan – Chief Guest, felicitation. Malathi Nagabhairava, the master of ceremonies, welcomed the audience. Ramu Arunachalam the temple’s secretary introduced the temple’s founder patrons and facilitated the jyoti prajwalana (lamp lighting) by Chief Guest Sri Subhash Razdan, Temple Founder Seshavataram Puranam, Temple President Rakesh Garg, Guru Neelima Gaddamanugu, and Temple’s head priest Sriman Puranam marking the auspicious beginning. Emcee, Dr. Madhav Durbha introduced Guru Neelima to the audience. Guru Dandhibotla Narayana Murthy penned the lyrics of this epic dance drama. During the initial acts of the bala (child) Hanuman an element of cuteness and innocence came through in the young children’s synchronized and coordinated performance. The stage lighting augmented the wonderful makeup and facial expressions of various characters. 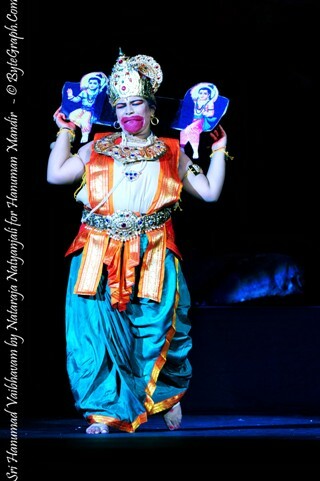 Navya Nuthivana, adorned as the Mighty Lord Hanuman, was outstanding. All the parts were played with an elegance and sincerity that could only be realized when seeing it in person. It was touching to see the gracefulness in the kids’ acts. Sets such as Ashokavana (royal garden of Raavana) were done in a grand manner. The Rama-Raavana war depiction action sequences were thoroughly enjoyed by the audience, young and old alike. The scene changes and Malathi Nagabhairava’s scene narration were done precisely and swiftly under Siva Gaddamanugu’s direction, captivating the audience for this entire 2-hour long play. During the concluding Mangalam scene, all artists were given a standing ovation from the devotion-filled and spellbound audience. Following the program, Hanuman Mandir board president Rakesh Garg thanked everyone for supporting the temple’s cause (raising funds for purchasing the temple land) and attending the magical evening. Chief Guest Subhash Razdan appreciated everyone’s hard work and dedication to make it a grand event. He asked all to donate towards a good cause for the Hanuman mandir expansion and also mentioned that temples have a social responsibility in inculcating good values to our community. 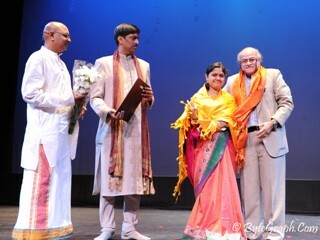 Guru Neelima thanked everyone and facilitated the artists’ felicitation. Hanuman Mandir’s treasurer Sachi Pati extended the vote of thanks. A saying goes, ‘We see God in our children.’ It felt this way when seeing the kids perform. One could see the divine energy come thru and feel Lord Hanuman, Lord Ram Parivaar were all there in front of our eyes. It was amazing to see the epic story come thru dance movements and facial expressions. To have the kids understand and emote the story of Lord Hanuman is a noble service. Such events encourage our children to be proud of our heritage and pass it on to our future generations. 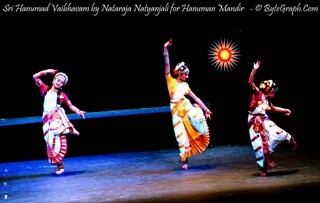 Dancers (Akhila Ballari, Bodhana Veeramachaneni, Manasvi Reddy Gaddam) performing invocatory dance. Indra (played by Sreeja Sabella) looks on as his elephant Iravatha (Sumedh Duravsula) is approached by Bala (young) Hanuman (Himani Veeramachaneni), treating it as a toy. Anjana Devi (Sonal Jape) and Kesari (Mahima Siripurapu) react while Bala Hanuman (Bodhana Veeramachaneni), after being hit by Indra, lies unconscious. After meeting Rama and Lakshmana for the first time, Hanuman puts them on his shoulders and takes them to King Sugreeva. 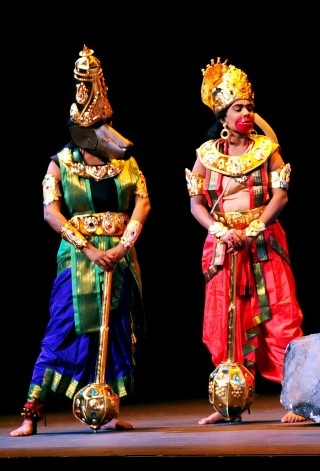 The sloth bear Jambavan (Chaitanya Tondepu) and Vanara (monkey) Prince Angaja (Anvitha Bommireddy) look on during the friendship pact between Rama and Sugreeva. Hanuman enters Lanka to find Sita and finds a group of rakshasa (demons) singing around the fire. The kids were amazing. They really got into their characters! Nothing but splendid..great show today! Excellent choreography, music and performance. Awesome dance by Hanuman..Congratulations Neelima Garu!! Great performance by all the kids. Ram, Lakshman and Seetha are very cute, and Hanuman is the star. Reminded me MS Reddy’s Bala Ramayanam movie. It was not a show for me. It sure was an experience. Salem Associates Inc. Garudavega International Couriers, YuppTV, Cube Printers, Ram D’s Music and DJ Entertainment, Hari Limousine, SariDhoti.com, Venkat Gaddam Real Estate, AgileITUS, North American Telugu Association (NATA), AdvBackoffice.com, Serenity Infotech, Brand Mortgage, Goldenline LLC, Amma Kitchen, AV Dental Care, Everest Technologies, Metro Medical Associates, Spices Hut, Tadka/Bamboo Garden, Hot Breads, TV Asia, and ByteGraph.com. Hanuman Mandir has grown from humble beginnings in 2010 with a small deity of Lord Hanuman to its current state as the home for the large Hanuman deity along with Lord Rama, Sita, Lakshmana and Lord Jagannath, Baladeva, and Subhadra Devi. A fundraising effort is ongoing to acquire a permanent home for the temple. The landlord of the temple property has offered the current site for sale to the temple. The temple is a nonprofit organization. This evening’s performance kicks off with dancers first praying to Lord Ganesha & to Lord Hanuman, to give them concentration and give them permission to perform without any obstacles and interruptions. Dancers perform ranga puja to sanctify the stage with scared waters and articles. This is followed by a traditional prayer requesting the blessings of Amba, to give them the strength & peace of mind to perform. Dancers pay salutations to Legend PadmaBhushan Guru Sri. Vempati Chinna Satyam, affectionately called maastaru garu for his immense contribution to Kuchipudi dance. This scene also introduces sutra-dhari to the audience, the one who ties the string of the story that spans across different scenes. Sutradhari presents the context of the story in this scene. This Act presents the birth of Lord Hanuman. Anjana Devi, the daughter of the great sage Gautam and Ahalya, marries Kesari, a great warrior of the vanaras. The couple did not have children for many years. Anjana Devi prays to Vaayu Dev for children. With his blessings, Anjana Devi gives birth to baby Hanuman. As a child, Hanuman is very playful and mischievous. One day, Hanuman flies into the sky and tries to catch the sun thinking it is a fruit. Hanuman’s naughtiness angers Lord Indra who throws his weapon, Vajrayudha, at Hanuman. Hanuman’s cheeks are swollen by the impact of the weapon. He becomes unconscious and falls to the ground. Anjana Devi prays to the heavenly Gods to save Hanuman. The Gods are pleased and they bless Hanuman to be a chiranjeevi. Due to his mischievousness as a child, Hanuman also received a curse that he shall remain ignorant of his own immense strength until he gets to meet Rama. As Hanuman grows big, strong, and intelligent, his mother sends him to serve in the court of his uncle Sugreeva, as a minister and advisor. In this Act we are going to present grown up Hanuman with various attributes and virtues which make him truly a great role model. Hanuman is very well versed in the Vedic scriptures. He is intelligent, and strong due to the blessings he received from the Gods. Though he had the potential to gain all the material wealth one could hope for, he was not interested in any material gains for himself. Instead, Hanuman places the interests of his king Sugreeva ahead and serves him. One should appreciate the modesty with which Hanuman performed his duties despite his great strength and potential. Such greatness of Lord Hanuman is captured in this act. The act concludes with Sugreeva approaching Hanuman and suggesting that they avoid trouble by staying away from the wrath of his own evil brother Vaali. Sugreeva expresses his confidence that the mere presence of Hanuman affords him with great protection. In this act, Hanuman disguised as a sage meets Rama and Lakshmana…. Sugreeva, the king of vanaras, while in exile with his ministers, sees from a distance Lord Sri Rama and his brother Lakshmana who are carrying bow and arrow. He is afraid they are the spies of Vaali and could be mercenaries. Taking cautionary approach, he asks the wisest of his ministers, Hanuman, to find out their true identity and the purpose of their visit in the forest.. Upon reassuring Sugreeva of his safety, Hanuman disguises himself as a sage and approaches Rama and Lakshmana. Being a scholar and well spoken individual, Hanuman accomplishes these tasks through his choice of carefully spoken words. Rama sees Hanuman approaching them. Observing Hanuman’s attire as a sage and his calm demeenor, Rama comments to Lakshmana that the sage must be a great being. Hanuman greets them politely and asks them why they are roaming in the forests where life is full of hardships. With deft choice of words, Hanuman praises Rama and Lakshmana. He also introduces himself as the minister of Sugreeva and narrates the atrocities of Vaali, thus preempting any suspicions on the part of Rama and Lakshmana regarding his motive. Sri Rama is very much impressed with Hanuma’s demeanor and asks Lakshmana to explain their purpose of being in the forests. Obeying his brother’s command Lakshmana narrates the story of Sri Rama’s vow to live in the forests for fourteen years to keep up his father’s promise. He also tells Hanuman about the abduction of Sita. Hanuma empathizes with the hardships faced by the brothers and reassures them that with the good friendship of Sugreeva, the brothers will be able to get rid of their hard times and leads them to Sugreeva. This act presents Rama and Sugreeva as they commit to being friends for life in the presence of fire. They both promise to keep a bond that transcends their distinct races and will stay through eternity. They both commit to each other that their friendship will be a true win-win by Rama committing to kill Vaali and thus ensuring Sugreeva to get his kingdom and wife back. Sugreeva takes an oath to help Rama kill Raavana and bring Sita back safely. This act describes the death of the evil king Vali….With Sri Rama backing him, Sugreeva goes to Kishkinda and challenges his brother Vaali to a duel. They both engage in a fierce fight.. Sri Rama stands ready with his bow and arrow behind a tree watching the brothers fight. However, due to the striking similarity between the two monkey brothers, Sri Rama is uncertain as who is Vaali and does not act. Sugreeva is defeated and seeks refuge at Rama. Lord Sri Rama asks Lakshmana to decorate Sugreeva with a garland and sends him to challenge once again. During the fight Rama shoots his arrow and kills Vaali. Sugreeva, thus becomes the king of the vanaras and sends them in all directions to search for Sita. The next act describes how Hanuman discovers his strength. The vanaras went southward to reach the great sea. The sea is hundred yojanas in length. None of the vanaras feel capable of crossing the sea and reaching Ravana’s kingdom, Lanka. They feel it is a dead end and are disappointed that they will not be able to accomplish their mission. Some even contemplate suicide in despair. Jambavan, the bear, another of the wise ministers of Sugreeva is the only one who knows the true might and greatness of Hanuman. However, Hanuman does not feel confident enough that he has the strength to cross the sea to reach Lanka. Jambavan reveals the curse given to Hanuman by the sages that his strength and supreme powers will be revealed to him only through others. He boosts Hanuman’s strength by praising his greatness. Hanuman prays to Lord Sri Ram, soars into the sky and starts flying effortlessly across the ocean. Several obstacles come in his way to tempt him and to stop him during his journey. A mountain rises from the depths of the sea and asks Hanuma to take rest. Hanuman politely refuses the offer and states that he is duty bound to fulfill the wishes of Rama and moves on. He battles two demons, Surasa and Simhika, and wins over them to get to Lanka. This act describes how the demons protecting Lanka are singing, dancing, and celebrating. They are unaware of the approaching danger in the form of Hanuman. Their overconfidence is evident in their retelling the stories of their King Ravana’s valor. They claim it is impossible for the enemy to penetrate the security around Lanka. They say that even Kubera (the richest of the Gods) gave up his wealth and ran away from Lanka fearing the wrath of the ten-headed, twenty-eyed demon king Ravana. They exuberantly celebrate in the abundance of wine, meat, and other items. However, they do remind themselves that they need to be vigilant in protecting the wealth of their fort. Our next act demonstrates how Hanuman disguised in a microform finds Sita in Ashokavanam. While the demons celebrate and dance, Hanuman begins his search for Sita in Lanka. He assumes a microform and enters the palace of Ravana. He goes through the palace looking for Sita everywhere. There he sees Mandodari (Ravana’s wife) sleeping peacefully in her mandir. He mistakes her for Sita. Then, he immediately realizes his mistake of assuming that a noble lady like Sita would live in the palace of the demon king Ravana and regrets the thought. He continues his search. He starts to worry that Sita might have committed suicide in despair. At last he enters Ashokavana (the royal garden of Ravana). Ashokavana is full of greenery and lush with ashoka trees everywhere. There, he finds a lady with divine features sitting under a tree, in the middle of the demons guarding her. The sadness on her face is very visible and it is clear that she is pining for something. Hanuman immediately recognizes her as Sita Devi. He hides in the midst of branches and keenly watches her. Ravana, the king of Lanka, walks into the garden and approaches Sita. He asks Sita to give up the hope of Rama finding her. Ravana asks her to accept him and live in the luxury of his palace. Sita flatly refuses him. Ravana is angry and sets a deadline for Sita to either accept him or be killed to be eaten and walks away in fury. Hanuman is excited that he found Sita and witnesses her greatness and her love for Rama in how she responded to Ravana. He anxiously awaits an opportune moment to approach Sita. Sita contemplates upon how to get the message to Rama regarding her whereabouts. She feels helpless and hopes for a miracle. Watching her grieve, Hanuman starts singing his message of hope addressing Sita. To earn her trust and credibility; he even shows the ring that Rama gave with his name embossed on it. He relays to Sita how Rama is constantly thinking of Sita, and does not even take care of himself. He narrates the story of the friendship of Rama and Sugreeva and how Rama helped Sugreeva by killing Vaali. Hearing his words, Sita feels very elated. She blesses Hanuman for delivering Lord Rama’s message. Hanuman offers to carry Sita on his shoulders and take her to Rama. Sita refuses the offer and suggests that Rama himself should come and rescue her. She gives Hanuman her chudamani, an ornament, so that he can show it to Rama. Hanuman bids farewell to Sita assuring her that Rama will return and rescue her. Upon taking leave from Sita, Hanuman transforms into his normal self from his microform and starts destroying the entire garden. As the demons come to catch him, he decimates Ravan’s army. However he also wanted to take this as an opportunity to meet Ravana and test his might. As part of his strategy, he yields to an arrow of Indrajit, son of Ravana, so that he could face Ravana. This is an illustration of Lord Hanumans’s keen intellect and his ability to go beyond the call of his duty of his master. Hanuman is presented to Ravana in his court. In front of the courtiers, Hanuman warns Ravana of the consequences of choosing rivalry with Rama. He asks Ravana to acknowledge his mistake and seek the mercy of Lord Rama. Ravana, being his egoistic self, takes offence at Hanuman’s suggestion. He orders Hanuman’s tail to be set on fire. Hanuman seizes the opportunity and sets Lanka on fire. This is a true illustration of Lord Hanuman’s attitude of courage under fire, literally and figuratively. Upon heaping destruction of Lanka, Hanuman safely reaches his vanara friends upon crossing the ocean. The vanaras along with Hanuman return to Rama. Hanuman informs Rama about Sita’s whereabouts and how she is being persecuted by Ravana. Knowing Sita’s whereabouts, Sri Rama is elated with joy. As evidence of him meeting Sita, Hanuman shows Sita’s chudamani, the piece of jewelry Sita gave him. Tears of joy swell in Rama’s eyes seeing Sita’s chudamani. He remembers how Sita looked wearing it. Hearing the news that Sita is alive, Rama thanks Hanuman and hugs him in delight. Under the leadership of Rama, the vanaras reach the sea coast. In order to cross the sea, they start building a bridge using rocks. Due to the grace of the Sri Rama’s name, the rocks magically float on the water forming a bridge to Lanka. Even the smallest of the beings, a squirrel, helps beyond his effort to help Rama to find Sita. An epic war that has not been witnessed before ensues between the armies of Rama and Ravana. Lakshmana kills Indrajit. Raavan launches Shakti (a divine weapon) on Lakshmana to avenge Indrajit’s death. Lakshmana collapses and faints. The physician of the vanaras, Sushena, prescribes the magical herb Sanjeevani to bring Lakshmana back to life. Hanuma could not locate the magical herb on the mountain Sushena referred to. Hence he uproots the entire mountain and brings it back to the battlefield. Lakshmana is thus saved. Upon this, Rama and Lakshmana along with vanaras kill many demons. Ravana enters the battlefield. As Rama keeps chopping off Ravana’s heads, they keep growing back again. Per Maatali’s suggestion, Rama prays to the Sun God and releases an arrow which kills Ravana. Sita is thus rescued and united with Rama. Sita, Rama, and Lakshmana along with the vanaras fly back to Ayodhya in a divine plane named Pushpak. Following Rama’s instructions, Hanuma informs Bharata to make arrangements for Rama’s arrival along with Sita, Sugreeva, and the vanaras. After 14 years of Vanavasam, Rama is warmly welcomed into his city Ayodhya by his brothers, Bharata and Satrughna. The people of Ayodhya celebrated in a festive mood as Rama, Sita, Lakshmana along with Hanuman and other vanaras walked into the streets of Ayodhya. The entire city is decorated with lights, flower garlands, and toranams. The joy of their arrival from the exile preceded them into the royal court. Everyone is anxious to see Rama , Sita, and Lakshmana. Upon changing into their royal clothes Rama and Sita enter the court with their entourage. Amidst huge celebrations Rama is crowned as the king by the great sage and royal guru Vasista. Rama addresses the citizens of Ayodhya as their newly crowned king. Rama thanks Sugreeva and vanaras for all the support that they have given him in finding the whereabouts of Sita, and for winning the war against Ravana and the demon forces. With his heart filled with joy Rama gives gifts and presents to everyone. When he turns to Hanuman he has nothing left to give. Looking at Rama’s predicament Hanuman says to Rama that he is not interested in any material gifts. With great devotion Hanuman says the biggest gift he can receive from Rama is the permission to chant his name and have a place at Rama’s feet. Rama is very much pleased by Hanuman’s devotion. He acknowledges Hanuman’s selfless service and presents Hanuman with a huge necklace and hugs him with delight. Such is the affection between Rama and Hanuman. Their story even after retelling, listening, or watching a thousand times would still be enlightening every time . Our next act illustrates the significance of Hanuman wearing sindoor all over his body. It also symbolizes Hanuman’s unconditional devotion to Rama. One fine evening Rama is relaxing in his mandir in the company of Sita and Hanuma.…. while massaging the feet of Rama, Hanuman sees Sita wearing sindoor on her forehead. Out of curiosity he asks Sita why she is wearing sindoor, and she responds by saying that it is for the well being of Rama. Hearing this, he gets a brilliant idea. He thinks if little bit of sindoor can ensure the wellbeing of Rama, he starts wondering how much difference a lot of sindoor can make. He implements his idea by wearing sindoor all over his body hoping that it will bring all the goodness in the world to Rama. Such is the true devotion of Lord Hanuman! This act illustrates how Lord reciprocates the true love of a devotee. Lord Rama and Sita take a permanent adobe in the heart of Hanuman by saying “I am in you.” The act then follows with Phala sruti by Sutra dhari saying anyone who sees, listens or narrates the story of Rama and Hanuma will be enlightened. This final act concludes with mangalam for Lord Rama, Sita, and Hanuman. As per the Kuchipudi tradition, all the performers congregate on stage and thank God and the audience for their presence and blessings.